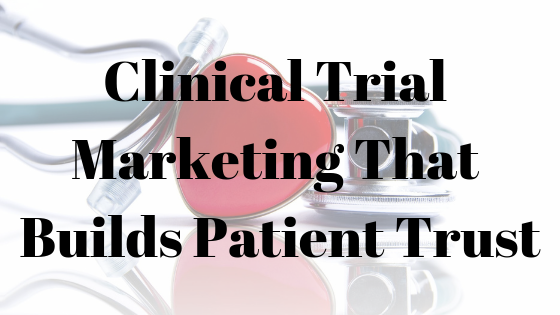 Each person responsible for the promotion of a clinical trial and the recruitment of patients needs to take a critical look at whether or not their marketing strategy does enough to answer the most important questions, whether basic or complex. If you are not providing adequate information about the trial, you are not building the trust you need and patients are losing interest. The purpose of marketing is to grab attention and draw people in. Building a conversation with patients and being a provider of pertinent information will help you do just that. The content of your clinical trial marketing will never be able to answer every single possible question that a patient might have. That’s OK. You don’t need to have all of the answers right off the bat but you should be able to show that your physicians and administrative staff are knowledgable. Utilize the research that you conducted about your ideal patient populations to anticipate what questions may arise. The language that you use in your clinical trial marketing is critical for reaching potential participants. You don’t want to make assumptions one way or another when it comes to what terminology your patients may or may not understand. Keep it as simple and as clear as possible. You can make this easier with some social listening. Join online message boards and social media groups specifically for the condition on which you are focusing. What recurring themes can you spot among posters? What terms are people using most often? What are the most frequently posted questions or concerns? Use this insight to help determine what language and information should be included in your marketing content. If your trial is present on social media (and it should be at least to some degree), that is an excellent opportunity to engage with current and future patients. Be prompt to answer any posts or private messages to pose questions. Get the ball rolling yourself and spark open conversations among visitors that are active on your page. Are there any particularly vocal patients that have completed your trial and would be willing to become social media ambassadors? Having an advocate on your side who has already been through the clinical trial experience helps to promote trust among those in your audience who may still be undecided. Trust is not simply one step in your clinical trial marketing strategy. If you want to make an impact with your audience and see positive results with your patient recruitment, trust needs to be woven into every element. Show your openness and commitment to those that you want to help. Need help with your patient recruitment marketing? Drop us a line!